Welcome to the FS1-EOC (“the Club”), the true home of the YAMAHA FS1-E and FS1 and the UK's only officially recognised Fizzy Club. The Club was only recently founded in 2009 by Fizzy enthusiast and collector, Per Brandt, who felt that this special legendary Sports Moped deserved a Club all of its own. The Club is now run under Per's stewardship by a small group of like minded enthusiasts, who appreciate everything about these early Japanese peds, their style, reliability, practicality, fun and that sense of freedom they gave us back as a 16-year old. To say that the FS1-E/FS1's have had a bit of a resurgence over the past ten years would be a bit of an understatement with huge numbers of 40-50 year olds now reliving the youth through these special little machines once again as well as capturing the imagination of the new generation of 16-year olds as their first rides. As such the Club has gone from strength to strength and has very quickly surpassed the 600 paid up members mark with members from all over the world. The Club's number one aim is to promote the enjoyment of the FS1-E/FS1 mopeds and the company of fellow members … … … … … that's it! You don't even need to own a Fizzy to be a member! 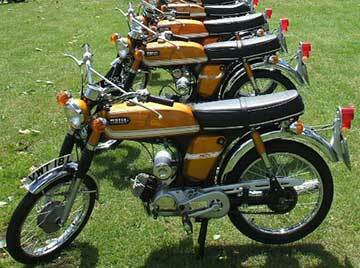 All that we ask is that members share the Club's passion for the most amazing Sports Moped ever to come out of a Japanese motorcycle factory. The Club has a number of different types of members, some that are totally obsessed by all things Fizzy (including the Chairman) with multiple Fizzy's in their ownership, to others who prefer to look in from the outside just using the Club as a source of useful information in assistance with their restorations and Fizzy ownership. The vast majority of the Members (90%) are UK based but the rest are spread all over Europe and even as far as Brazil and Australia, yes one ex-pat down under missed his FS1-EDX that much he bought one and had it shipped down there! We aim to support our members with a range of services and are looking to expand on this side of membership in the next few years. Please have a look at the pages on this website and see what we can offer; if what you need is not there please ask! As the membership numbers grow the Club would also like to set up Regional Sections so that smaller local events and meetings can be organised rather than just nationally attended shows and ride-outs. If you are interested in helping with this and volunteering as a Regional Co-ordinator please get in touch with Per Brandt. This would involve inviting people from your local area to a local meeting on a monthly basis to discuss bikes and socialise. For many this is an important part of club membership and it's a chance to swap knowledge, access help or pass on your hard gained expertise, so we are keen to make this happen in 2013 and going forward. Members will receive 4 copies of our electronic newsletter "Fizzy News" each year all packed with the articles, features and stunning pictures of all things Fizzys. Included with the newsletter is a Club Directory crammed with specialist services, details of local sections (as they get set up), club merchandise. For members needing help with parts there's a wanted section where you can advertise for that elusive part you need. Together with our Classic Bike Insurance partners, Footman James, the Club has secured some very good deals on classic bike insurance. A year's membership is normally easily recouped the first time you renew your cover. No catches, just join, get a membership card and enjoy another club benefit. With ever tightening automotive legislation the concerns and requirements of anyone associated with classic vehicles needs to be addressed. The FS1E-OC is an affiliated member of the FHBVC (Federation of Historic British Vehicle Clubs) and this organisation looks to voice our concerns when ill informed decisions are about to be taken that could impact upon our bikes and pastime. Although not directly involved in political lobbying the club is looking at other ways it can progress its members concerns and rights within European transport policies and plans. Thanks for taking time out to read this. We hope it's given you a flavour of what we are about and represent. Remember, the club is for all YAMAHA FS1-E and any FS1's or their derivatives including Specials and what's more the FS1E-OC is YOUR club.